eMachineShop now makes it quick and easy to order low-cost laser marked custom parts. You can supply your own parts or we can manufacture and mark parts for you. We’re ready to help you with short and long runs. Laser marking offers a low-cost way to add text and graphics to parts without expensive tooling. Text and graphics can be added to any flat surface in small or large fonts. Compared to laser engraving, use of a low power laser helps keep cost down. Another advantage of laser marking over laser engraving and laser etching includes the fact that laser marking does not remove material. When laser marking powder coated parts, we recommend using filled fonts. For other applications, both filled and outline fonts work well. Recommended minimum height of font is .08″ for anodized parts and .14″ for powder coated parts. The max size of a part we can laser mark is 22″ x 14″ x 2″. Please note: Laser marking at eMachineShop requires a flat surface. 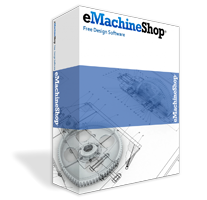 To have parts laser marked simply add laser marking to your design in the eMachineShop CAD software or specify what you need via the Quote button below.